The Arizona Historical Society Pioneer Museum, formerly the 1908 Coconino County Hospital for the Indigent, is dedicated to preserving and interpreting the history of Flagstaff and Northern Arizona. The museum features permanent and temporary exhibits exploring the historical development of the community and region. Monday – Saturday: 10:00 a.m. – 4:00 p.m.
Closed on Sundays and FEDERAL holidays. Two-for-one admission the first Tuesday of each month. In 2018, the Coconino County Hospital for the Indigent, now the Pioneer Museum celebrates its 110th birthday. Accessible parking and access to the first floor of the museum is available on the West side of the building immediately adjacent to the museum. Passengers may be loaded or unloaded at the front of the museum. A small parking lot is directly West of the museum. There are numerous other parking areas to the East and North of the Museum. A wheelchair is available free of charge at the museum on a first come, first served basis. Please ask at the front desk. Grounds. Please clean up after your pets. Beginner Blacksmithing 101 Pioneer Museum 3901 W Pioneer Rd. Learn the basics of practical and artistic blacksmithing with our resident and extremely talented smithy, Matt Freyer during this 2-hour class. The class is limited to ages 18 and above. $40.00 per participant and all tools are provided — pants, long-sleeve shirts, and boots/closed-toe shoes required. Space is limited; Reserve your anvil SOON! Contact Jill Hough at [email protected] or 928-774-6272. Night at the Museum: Yarn Bombing Pioneer Museum 3901 W Pioneer Rd. Once again, we’ll be wrapping up the Baldwin locomotive in all things knitted and crocheted in anticipation of the 2019 Flag Wool & Fiber Festival. This is a FREE event. Beer and wine served to help the creative juices flow. Contact Jill Hough 928-774-6272 [email protected]. Night at the Museum: John Wesley Powell 150th Pioneer Museum 3901 W Pioneer Rd. Colorado River trivia throughout the evening and have a limited edition HBC Powell commemorative brew to drink! FREE to the public; beer and wine sold at a modest price. RSVP and questions: 928-774-6272 [email protected]. Flag Wool and Fiber Festival Pioneer Museum 3901 W Pioneer Rd. Greatly anticipated FREE event with live animals, workshops, demonstrations, fiber arts competition, fiber marketplace, food, and drink. Two days--June 1-2. For additional information, visit https://www.flagwool.com. Greatly anticipated FREE event with live animals, workshops, demonstrations, fiber arts competition, fiber marketplace, food, and drink. Two days–June 1-2. For additional information, visit https://www.flagwool.com. Flagstaff Folk Festival Pioneer Museum 3901 W Pioneer Rd. The Flagstaff Folk Festival proudly showcases the best in folk and acoustic music in Arizona and beyond featuring over 150 acts on five stages, including workshops, jams, and more. Admission is always affordable and this is a very family friendly experience. The festival is produced by The Flagstaff Friends of Traditional Music in partnership with Flagstaff Arts Council and the Arizona Historical Society Pioneer Museum. This is a two-day festival, June 29-30. Beginning Line Dancing Workshop Pioneer Museum 3901 W Pioneer Rd. More info: Jill Hough 928-774-6272 or [email protected]. 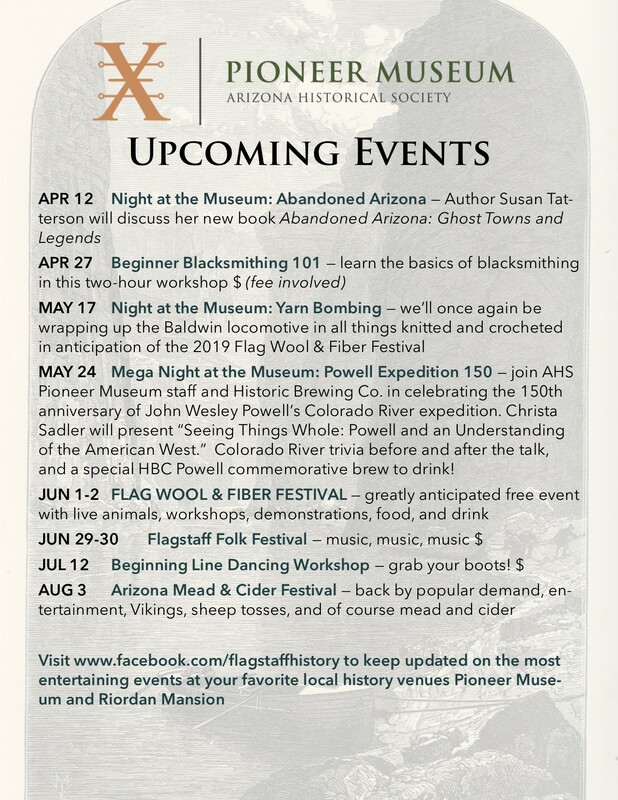 Check out the full list of programs at the Pioneer Museum in Flagstaff. The Arizona Historical Society and the Pioneer Museum are pleased to tell you about our newest exhibit, Todos Unidos: The Hispanic Experience in Flagstaff. This exhibit focuses on how Hispanic residents experienced Flagstaff from the 1880s to 1950s. Todos Unidos is an opportunity to explore a wide range of complex historical issues interpreted through unique objects and immersive text. The exhibit presents the connection between past and current topics facing our community. Debuting with Todos Unidos is Cuseum – a new way of interacting with visitors. Cuseum is a digital curator mobile device application adding depth and experience for visitors to enjoy with the exhibit. Cuseum is a free downloadable smart phone app that will assist visitors in the exploration of Flagstaff’s communities. By providing access to exclusive exhibit media content and location based notifications, visitors can continue their museum experience long after they leave Pioneer Museum. To download the Cuseum app for Todos Unidos, click here. Explore the history of Northern Arizona and Lunar Exploration at the Pioneer Museum. 2019 marks the 50th anniversary of the moon landing. Discover Flagstaff's connections to this historic event! Inside what was once the hospital’s operating and recovering rooms, you will find information about how the indigent were cared for at the Poor Farm from 1908 until the 1930s. Beginning in the 1880’s, when Flagstaff was founded, and ending in the 1960’s, when astronauts trained for their trip to the moon in town, our timeline of Flagstaff’s history stretches across the whole second floor of the museum. Peer into each room to see artifacts from each decade and read about the rich history of our mountain town. Visitors are introduced to the Pioneer Museum by two impressive artifacts: a 1929 Baldwin articulated locomotive used in logging operations with tender and log car and a Santa Fe RR caboose dating from the 1940’s. Visitors can enter the caboose and view an exhibit on the train personnel who would have lived in it when it was riding the rails. The historic 1908 Doney Cabin was relocated to Pioneer Museum from east of Flagstaff. Visitors can explore the one-room cabin and learn about Ben Doney, the colorful local character who built it. The grounds also house our heirloom garden, a 1915 Model T, many pieces of farm equipment, a chuck wagon, and a La France fire engine that saved Riordan Mansion from a devastating fire in 1921. Our education program offers historic activities and guided tours for school groups from 1st-12th grades. Hands-on activities engage children at all levels, teaching them how much different the world was when pioneers had to make their own tools and household items. Our blacksmith demonstrates how to shape an “S” hook or a nail from a piece of scrap metal. Students dip candles (which they can take home) to learn what life was like before electricity, and twist sisal into a jump rope that they can take back to their classroom. These activities and demonstrations, connecting history to modern life, make for a meaningful and engaging visit. Contact the Museum Education Curator to build a visit focused on what your students are studying in the classroom. Hands-on activities are $3 per student; tours and demonstrations are $2/student. Chaperones are admitted free at a ratio of one adult per five children; additional chaperones are $6 apiece. For more information, see our detailed Activity Guide. On a forested terrace overlooking Fort Valley Road, the Pioneer Museum property offers a rustic, down-home backdrop for your special event. Whether you are looking for a country barn setting or an outdoor experience among the ponderosa pine trees and homestead-era cabins, the museum, built in 1908 as the Coconino County Hospital for the Indigent, and its 3-acre grounds provide an intimate, country feel to any life celebration. The Pioneer Museum is perfect for small gatherings of up to 60 people. The Fort Valley Mercantile offers the perfect gift or souvenir. Step into the past with old-time toys or stay contemporary with a remembrance of one of our current exhibits. We offer something for every age group and interest. Heck, we’ll even sell you a beer or glass of wine!